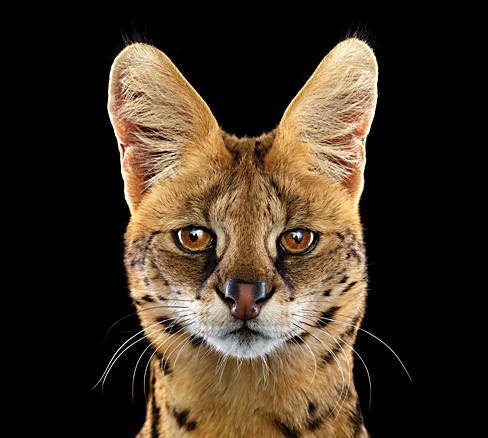 Brad Wilson’s portraits spotlight the stars of the ABQ BioPark Zoo. The hot-pink flamingos standing around near the entrance to the ABQ BioPark Zoo will take your breath away. Even more breathtaking is just how intimate the encounter feels—human and flamboyant tropical bird separated by only a few feet. When fine-art photographer Brad Wilson visited the zoo recently to take the series of his signature animal portraits shown here, he expressed his own vision of the closeness between species. Founded in 1927, and originally named the Rio Grande Zoo, this was a place you drove through. The zoo of 2013 is a very different . . . animal. Now part of the ABQ BioPark, a unique biological sanctuary that includes a botanical garden, an aquarium, and a riverfront preserve, the zoo has established an enviable reputation for zoological stewardship and recreational opportunities for visitors. The herds of teens, seniors, and families strolling the 2.2 miles of pathways that wind through the zoo’s 12 major exhibits on any given day supply anecdotal corroboration that, along with its sister institutions, the zoo is the most visited attraction in the state. They come for the animals, of course: 1,200 individual creatures (not including the fish), ranging from an African elephant to an Amazon milk frog. And throughout, the same sort of intimacy experienced with the flamingos—the animal sounds, the smells, the eerie gaze of intelligence from the chimps—hold you close. For those who’d like to close that gap even more, the zoo offers encounters like parrot feedings, porcupine walks, and summer camp for the kids. The zoo is also the setting for a wide range of cultural and community events, including concerts featuring the likes of Colbie Caillat and Ziggy Marley, and holiday celebrations such like the madly popular Halloween Zoo Boo. As meaningful as the zoo is to the community, it’s just as important to conservation and species health. In these areas it has been an innovator. Take, for instance, the Asian elephant. These days, most zoo animals are born in captivity, and so don’t have a chance to learn how to behave naturally. The zoo’s elephant program is a unique experiment in how to address this problem. The zoo is also involved in the crucial task of ensuring the continued survival of endangered species, like the Puerto Rican Mona coqui frog (of which the zoo has the only mating pairs in captivity), the Mexican gray wolf, and the Socorro dove. The paths through the zoo wind among exhibits and habitats. The result, frequently, is surprise. But, as in Wilson’s portraits, perhaps nothing is quite as surprising as the gradual recognition of how tightly bound together we all are.